All things truffle stay at top of mind when you're in this business up to your eyeballs like I am. We have had lots of people come to the farm to see the orchards and hear all about truffle growing. We needed to be able to serve them something made from truffles while we sat and answered their questions. A little warm bread smeared with truffle butter seemed to be just the thing. OK, so where do you get truffle butter? Right here, of course! So, that's how the whole truffle butter as a value-added product got started, sometime in 2009. I started playing around with adding frozen chopped black winter perigord truffles to high quality butter from various sources. When I was satisfied with the mixture, I started looking for an ongoing high quality butter source. Ashe County Cheese in West Jefferson, NC http://www.ashecountycheese.com/ seemed the perfect fit. Their butter is quite good and has a slightly cheesy flavor. It's wonderful with truffles. The next issue was how to package it. A friend suggested that we look for a little glass condiment jar. Turns out, it wasn't that hard to find and it's classy enough for a truffle product. So, we have the recipe, the container, the inspection from the NC Dept of Agriculture. Now we just need some customers. Talking to chefs has been great. They have good ideas and they ask great questions. Trouble is, they all say they make their own truffle butter. Really, do you? Because I have never been offered truffle butter in a restaurant and rarely do I see it on the menu as part of the preparation of any dish. So, what gives? It took a while to win over a couple of chefs in our area, Shelton Vineyards at Harvest Grill in Dobson, NC http://www.sheltonvineyards.com/default.aspx?shelton=40was the first. Noble's Grill, Chef Phil, http://noblesgrille.com/?page_id=15 was the second. These guys get it and they are fabulous chefs. Others followed after our participation in the Taste of North Carolina dinner at Washington Duke Inn in Durham this year. 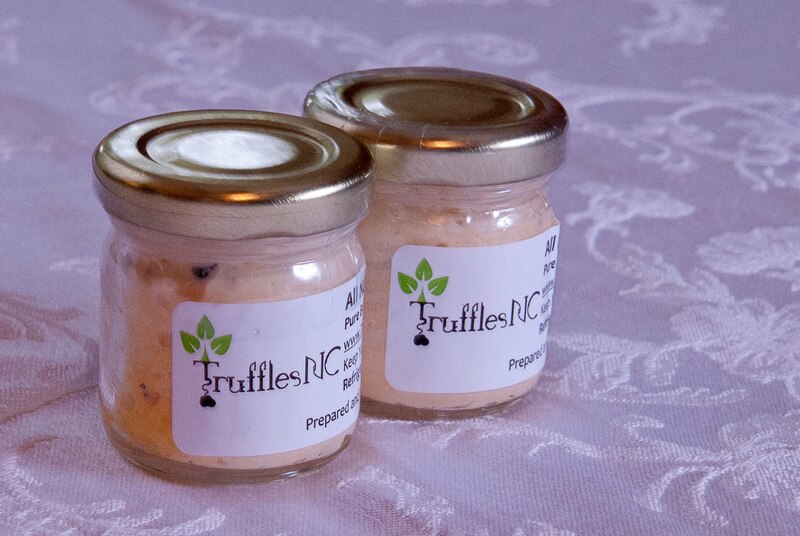 The word is starting to get around that, if you want REAL truffle butter, it comes from Truffles NC. It's the real thing. Now, if you haven't tried it yet, please visit one of our retail outlets: Ragapple Lassie Vineyards in Boonville, http://www.ragapplelassie.com/new/ , Let it Grow Produce in Winston-Salem http://www.localharvest.org/let-it-grow-produce-M38169 , Reynolda Farm Market in Winston-Salem http://www.localharvest.org/reynolda-farm-market-M38872 Mostly Local Produce in Lewisville, NC http://mostlylocalmarket.com/ , NOFO at the Pig in Raleigh or Wilmington http://www.nofo.com/tour_pig.php or contact me directly via the Truffles NC website if you want it shipped directly to you. After placing our truffle butter in several stores and with several chefs, we decided to consider private labeling. A perfect opportunity then presented itself with Maple View Milk Farm in Hillsborough, NC. http://www.mapleviewfarm.com/ (funny how that happens when you decide an idea has some merit) Maple View also produces fabulous butter and was interested in our collaboration to introduce the product in the Hillsborough/Chapel Hill/Durham/Carrboro market. They now distribute our truffle butter under the Maple View label to lots of stores in that geographic area. Try Weaver Street Grocery for example. The truffle butter story continues and we stay very busy keeping our orchards groomed and making the butter. The Truffle Orchard truly took on a life of its own. Please try the butter and let me see your comments. Hoping to hear from you soon.